Came a phone call this morning. It was Sam. I knew it was Sam because I could only understand one in twenty of the words uttered: Sam is a Scotsman, Scottish, from Scotlnad and very probably wears the McEachern Tartan but very probably doesn't wear it sitting next to the Queen and you very probably can't google Images of him sitting there. - Not that I am in any way suggesting anyone should google Images and try to find pictures of kilted Sctosmen sitting next to the Queen. Why can't I spell Scotlnad? Or Sctosmen? Sam's trike had broken. We need a discussion of aluminium and whether it is ever a suitable material for making recumbent trikes out of, and I imagine this discussion will become very heated because it's a bit like being able to spell Scotsmen. There are people who can spell Aluminium. There are also Americans. - And in passing, there is a worrying tendency for the smart young journalists who people the airwaves here to adopt Americanisms and I have heard 'nine through five' as if there were sentient being who might tolerate such a phrase, and I have also heard 'A through Zee' and if I hear it again I will actually kill myself. My American friends sometimes ask me why the Arab world hates them and in fact it is because they say Missile as if it were a Catholic devotional service book and the Arabs - well, the devout ones - are all worried lest that is what America is aiming at them. If they knew it was only Missiles they wouldn't be nearly so bothered. Arabs are accustomed to Missiles. - D'you know, I think I ought to get back On Topic lest someone sidle up to me with a rucksac on and someone else blow an entirely innocent bus queue to bits in a deeply committed act of incomprehensible self-sacrifice. Sam's trike was built locally by a friend of both of us and it handled superbly. But it was made of aluminium. And it sort of - well - snapped. 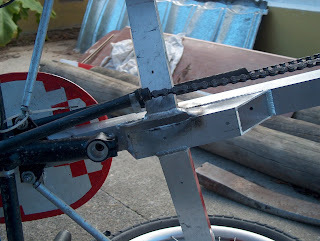 It would not be the first aluminium frame I have seen that snapped. I imagine it is not an entirely unfamiliar theme to anyone in the BHPC. But there is this myth about aluminium and light weight which since aluminium is about three times as light as steel is understandable, but it is also three times less stiff than steel and sometimes basic arithmetic tells us stuff that - well anyway I'm not here to do a sermon because someone might sidle up to me with a rucksac on. Sam's trike had broken with Sam's companion on board and she hadn't enjoyed it and I have a MIG welder. You can weld aluminium with a mig welder (clue: argon) but only if it's powerful enough and mine isn't - I've tried - so the conversation revolved around using all the trike's expensive components on a steel replacement frame; or building a back-to-back tandem trike; or building a tandem Periscope idea thing that I've nicked off Marec Hase. (We saw two of these when first we came to New Zealand, each being ridden by a German, each with a baby German on the front.) We all like the idea of being able to talk to one another on rides, and a disadvantage here on long empty roads is that if you ride side-by-side, there are people who feel compelled to drive an inch from your handlebars and hoot furiously because they aren't aware that this is legal. Something tells them it isn't. And simultaneously tells them that they are temporarily appointed Guardians of the Highway with especial responsibility for Cyclist Discipline (Single File Only). Marec Hase's Periscope. Pino, probably, this one. Sam had also brought with him his Rebel trike, a machine built here and a whisker under a metre wide which is probably to do with New Zealand laws about what does and doesn't constitute a 'bicycle'. (You aren't allowed a sidecar on a bicycle. I would love to research the rationale for such a law.) 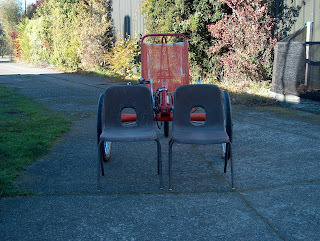 But we tried putting two small child's chairs next to one another and found that a recumbent sociable trike would be very sociable indeed, and should Her Majesty come over and choose to ride with Sam in his native garb, he would need to keep a very careful eye on the wind direction. Sam has some experience of sitting on tandems, though not with the Queen, and said we'd need strong wheels and strong bottom bracket axles. And I, by inference, started to get all worried about whether 12mm sub axles and 36-spoke 406 wheels are up to a recumbent back-to-back tandem. I fancy they might not be, but in my case N = 0 and I fancy statistically one might with advantage require a greater sample to make a decision.